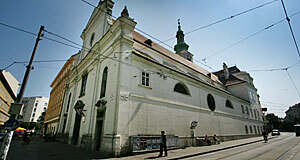 As I am sure you have noticed as a reader of TourMyCountry.com, that Vienna is anything but short of Baroque churches. The Paulanerkirche Church in the fourth district of Wieden is another example for the genre, and a rather good one. The oldest records of a church on the site of today′s Paulanerkirche date back to 1211. Back then, the church was dedicated to St. Anthony. Emperor Leopold I gave the church to the Order of the Holy Spirit. In the course of the first Siege of Vienna in 1529, the church was destroyed, the order left Vienna and was soon dispersed all over the Central Europe. In 1627, Emperor Ferdianand II donated money for the construction of a new church on the site of the old Anthony church. At around the same time, the Emperor called the order of Francesco of Paola (Paulian Order) to Vienna and the new church was meant to emphasise the close ties between Austria and the Spanish Netherlands - which were the patrons of the Paulian Order. Until 1651, the new church was built in a set with an appropriate monastic building. Unfortunately, the Paulanerkirche and monastery did not last very long: When the Turkish armies returned in 1683 for the Second Siege of Vienna, the defenders of the city destroyed all high stone-buildings in the suburbs that were close to the city walls. This was meant to prevent the Turks from taking advantage of the buildings to elevate cannons and other artillery and thereby, increase the range of their cannonballs. Once that the Turks were defeated, the Paulanerkirche and monastery were re-built in Baroque style. The façade and outside of the Paulanerkirche are plain and nothing exciting. The interiors are more elaborate with one central nave and side-chapels. The central altar was donated by a monastic community of Vienna and dates back to 1718. Two of the side-chapels include works by the fairly (ie locally) famous Baroque painter Paul Troger. The Paulanerkirche is a nice stop-over attraction off the beaten track, or interesting for people who happen to live in the fourth district of Wieden or who are particularly interested in Baroque architecture. Otherwise, the neighbourhood of the Paulanerkirche is nice, with cafes, bars and independent stores in side-alleys worth being explored. Attractions nearby the Paulanerkirche include Schwarzenbergplatz with its numerous attractions: The Palais Schwarzenberg, the Hochstrahlbrunnen and the Heldendenkmal; towards North, you find the Stadtpark and Kursalon; the National Mint; the Museum of Applied Art. Towards Rennweg, you find the Gardekirche, the Salesianerinnenkirche and the Belvedere Palace. Towards North-East, you get to the Karlsplatz with Karlskirche, Wien Museum, Künstlerhaus, Wiener Musikverein and the Secession. Further towards north, you get to the Ringstraße and straight into the first district.